Here is my first blog post since March. It’s been a whirlwind. I had a few challenges earlier in the year. Then I retired from my public service job, then took another position in my former field, decided to end my challenge blog Another Freaking Scrappy Challenge (that was such a hard decision to make, and I do regret it – although I just cannot make the time for it now.) And when I did have time to sit down at the computer, I’ve had computer problems. 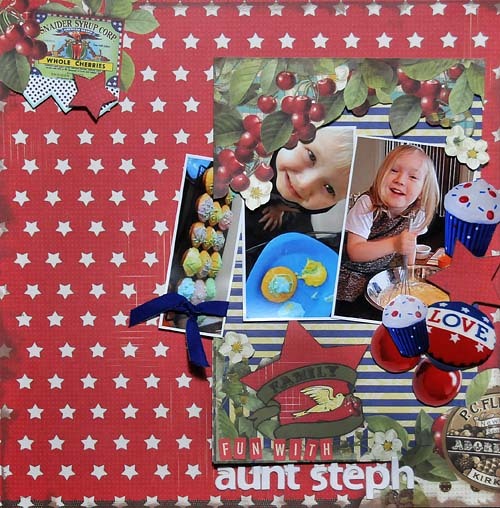 For some time now I just have not had the time to pursue any of my creative outlets, including scrapbooking. Today is a great day – I have finally been able to find time and be able to create. I found this new blog in a very roundabout way. I attend Lisa Furtney’s awesome event, Scrapfest twice a year in Kitchener and in Oshawa, and I always take a look at the teacher line-up to see who interests me. This year she announced that Agnieszka Bellaidea will be teaching in Oshawa in the fall. 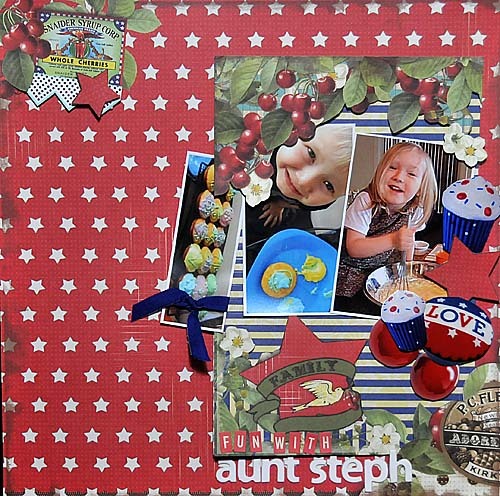 Following the link to Agnieszka’s blog, I found a blog posting where she announced the challenge this month at Scrap Around the World – Helen Tilbury’s new challenge blog. 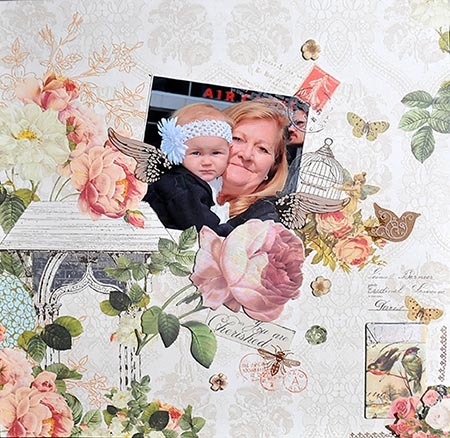 Helen’s blog uses a mood board and sketch this month for the challenge. 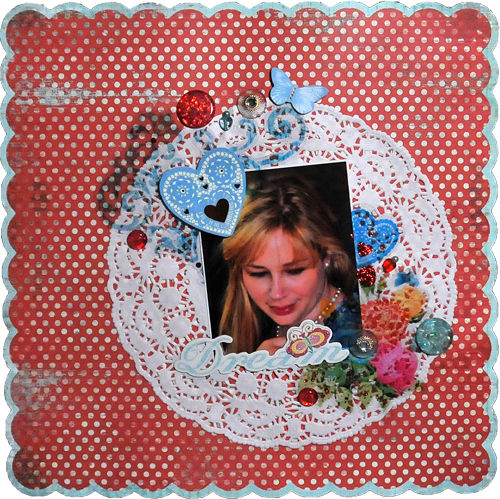 I was inspired by the two photos on the top line of the mood board – the colour, and the mood of the two photos led to the photo and the Webster’s Pages Country Estate paper that I chose and used. The paper reminded me of the sketch, and I have remained true to the main elements within it. 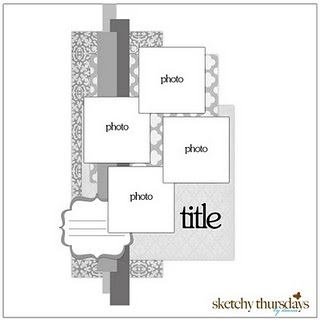 Anyway, here is the layout. I’m so happy to have been able to create a bit again. I hope you like it. Please come on out to the blog and play with us!!! Fave collection, and farewell to a great scrapping inspiration!!! 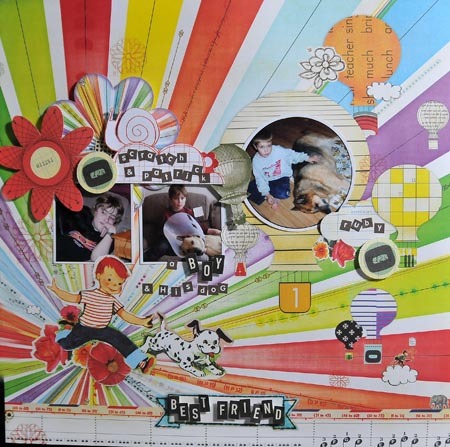 Julie Tucker-Wolek had been running a wonderful scrapbooking challenge blog for the last two years called These are a Few of my Favorite Things. She has done a wonderful job of it all, and frankly, her prompts have been inspirational for me. Julie has moved on to many other scrapbook industry pursuits and challenges, and has realized that she doesn’t have the time she would like to devote to her blog. She will, however, keep her blog open for reference and inspiration for followers. Her last challenge is to scrap your fave collection. Mine has to be my dolls. My father was a Canadian Air Force military member. He was transferred to Marville, France when I was a girl in first grade. I had a beautiful group of dolls, who were my babies. I had named each one, and they were special to me. Because of our transfer overseas, I had to give them all away. We could take very little with us on the plane. It broke my heart. Before we left, my mother let me choose a doll to take with me on the plane at a store we visited. I chose a stuffed Topo Gigio toy. Soon after we were overseas, there was a group who knocked at our door wanting donations for the poor. I gave them my toy. We tend to compensate ourselves and our children for what we think we missed in our childhoods, and well, I can buy a doll that appeals to me now, and I have when it has reminded me of something or someone. Fortunately I have not gone overboard, and have not bought a doll in years, but I would say they were my favourite collection. The paper I used was from the Webster’s Pages Ladies and Gents collection, Framed Beauty and Groomed Traveller. I chose it because of the colour. 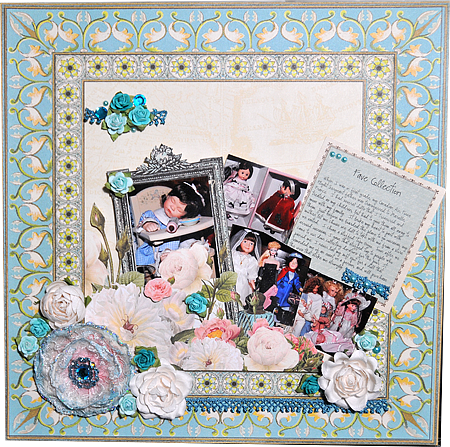 I had been inspired from Tanya Tahir and Nikki Antonello’s challenge at Get Picky – the blues and tans of this paper were much like the hues in the poster they posted for inspiration for their latest challenge. I hope you enjoy this layout! Please mark your calendars for the launch of my new challenge blog another freaking scrappy challenge … on the 30th of July. We are looking for guest designers for the launch challenge, and will be making a call for a design team after the launch. Please join us for fun and sharing!! Our daughter Stephanie Pennington loves to spoil her nieces and nephew and younger siblings. These photos are taken at her place when she had our grandchildren Brynn and Kieran Zwanenburg stay with her for a while. They made cupcakes, put family member’s initials on them with icing – then Steph uploaded the photos on Facebook and tagged each member whose cupcake was featured in the photo. Was a cute way to alert us all that there were some real sweet photos online about their fun week that we should peek at!! I used Webster’s Pages Hollywood die cut paper and Webster’s pages embellishments, as well as items from my stash. Oh yes, I snuck a little bit of Webster’s Pages in there too, can you spot it?????????????? Here are my parents Bob and Mary Wride, circa 1956 at an unnamed beach. The beach is likely near or at Cold Lake Alberta, where they were posted during their courtship and early marriage. 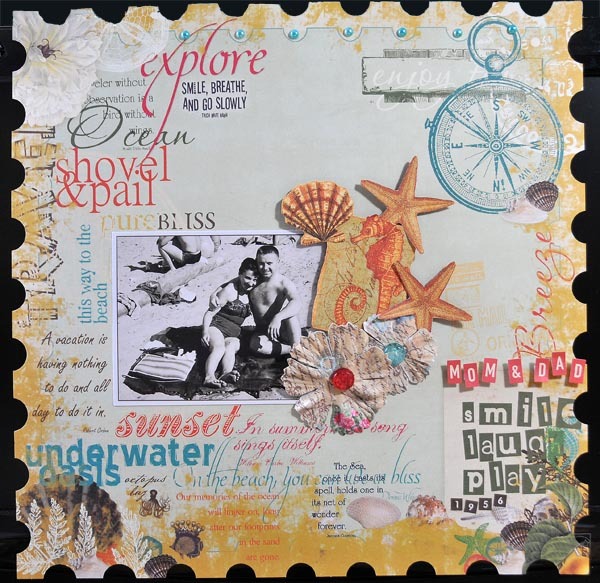 I used Webster’s Pages Seaside Retreat diecut for this layout. The embellishments were cut from the design on a sheet of Graphic 45 Botanicabella Collection paper, an economical way to make embellishments for a scrapbook layout. I used foam squares to raise the cut-outs up, giving a layered look to my layout. It is a real pleasure capturing these treasures of our family’s early life.